Nebula is a open source project created for Docker orchestration and designed to manage massive clusters at scale, it achieves this by scaling each project component out as far as required. 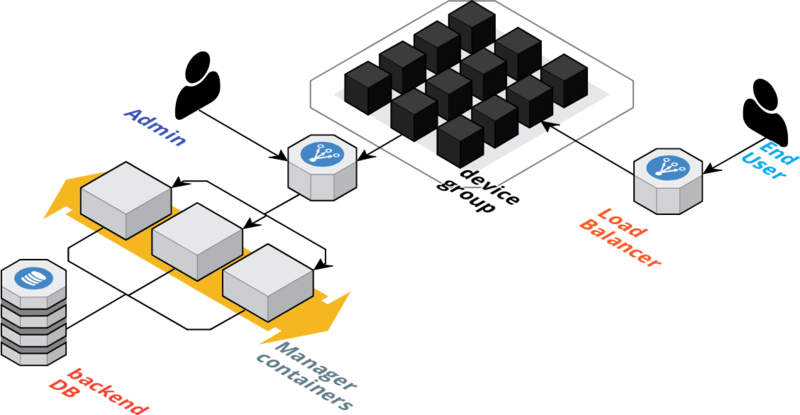 The project’s aim is to act as Docker orchestrator for IoT devices as well as for distributed services such as CDN or edge computing. Nebula is capable of simultaneously updating tens of thousands of IoT devices worldwide with a single API call in an effort to help devs and ops treat IoT devices just like distributed Dockerized apps. Change # of containers running per core/memory/instance. 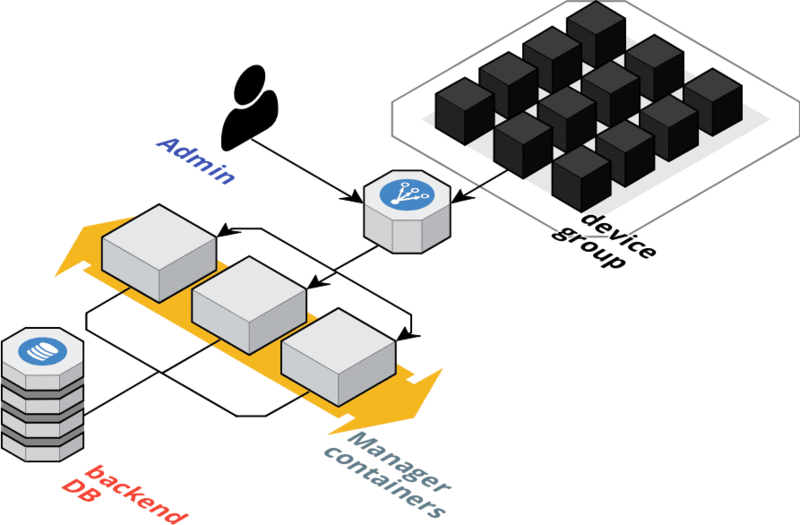 Manage multiple apps over different worker servers, each server "device_group" can have an unlimited amount of apps added\removed from it which will then be picked up by all devices that are part of that "device_group". Set containers with privileged permissions. Auto integrate with Dockerfile healthchecks to restart unhealthy containers. manager - a REST API endpoint to control nebula, fully stateless (all data stored in DB only). worker - a container which periodically checks in with the manager and manages the worker server it runs on, one has to run on each worker, fully stateless. 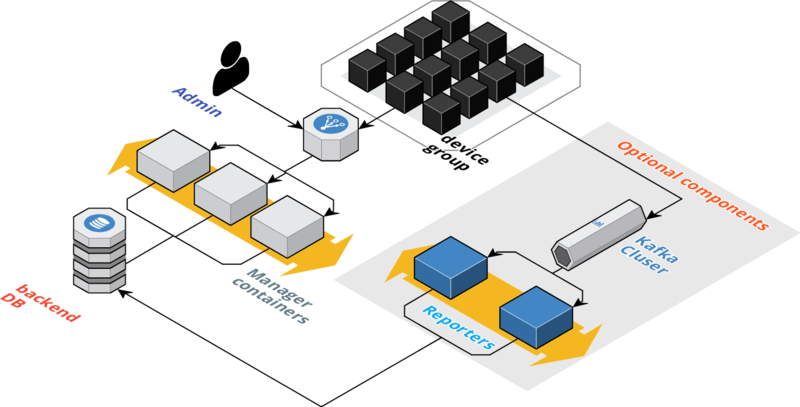 There is also an optional third component (the reporter) which can be added to allow managed devices be quried about their state (this also requires adding a Kafka cluster to the design). Due to clever use of TTL based memoization it's possible to manage millions of devices with a single Nebula cluster without overloading the backend DB (or having it ridiculously large) & due to Kafka inspired monotonic ID you can rest easy knowing that the managed devices will always match the most recent configuration. A form of docker configuration management, think of it as a cross between Docker-Compose to Puppet\Chef only it also pushes changes in configurations to all managed servers. This is an open source project, see attached license for more details. While still being a young project Nebula is already seeing production use at multiple companies across a variety of industries. Help is very much welcomed. Tested OS: CoreOS, RancherOS, Ubuntu server 14.04 & 16.04, CentOS 6 & 7, Amazon linux, expected to work with any Docker compatible Linux distro. Tested Docker versions: each Nebula version is tested on the latest Docker version at the time of it's release but any Docker version that has support for user networks should work with Nebula.